Your message has been sent to Custom Jewel . Like authorSTREAM? Give us a +1! 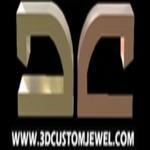 3D Custom Jewel is your one stop destination for high quality 3D jewelry designs based on your ideas, photos or drawings. Using the latest 3D tools and technology we can create the most accurate and detail 3D jewelry designs for easy jewelry making. You easily make a ring, pendent, coin, necklace or any kind of ornament based on the 3D designs and eliminate any kind of errors in the design.